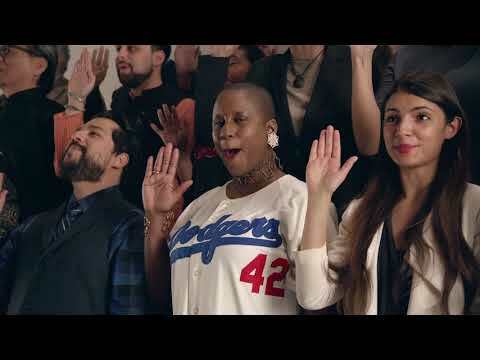 NEW YORK, Jan. 23, 2019 /PRNewswire/ -- Today, Budweiser released its Super Bowl LIII commercial, bringing its long-term commitment to renewable electricity to the biggest stage of the year. 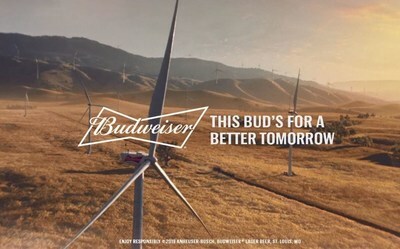 Last year, Budweiser announced its commitment to be brewed with 100% Renewable Electricity from Wind Power*, and to celebrate, the King of Beers will showcase this commitment in a commercial titled, "Wind Never Felt Better," featuring the iconic Budweiser Clydesdales alongside wind turbines, all set to the soundtrack of music legend Bob Dylan's "Blowin' in the Wind." 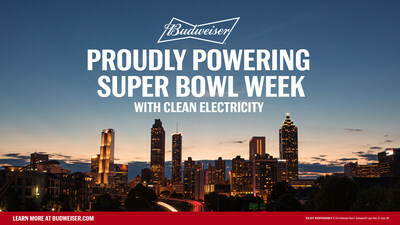 Budweiser brings its Super Bowl message of renewable electricity one step further by powering the host city of Atlanta with clean electricity for Super Bowl week. This Bud’s For a Better Tomorrow. "Super Bowl is one of the most exciting times of the year for our team, and people all over the country. Those who wait for the best commercials all year expect Budweiser to show up big, and we felt there was no better way to show up this year than to talk about our commitment to Renewable Electricity," said Ricardo Marques, VP of Marketing Core & Value brands at Anheuser-Busch. "We are proud to be the first Anheuser-Busch brand and the first major beer brand to be brewed with 100% renewable electricity from wind power and hopefully we can use this moment to inspire others in our pursuit for a more sustainable future." To further emphasize the importance of Budweiser's commitment, the company is donating clean electricity to Atlanta to power the city the week of Super Bowl. Atlanta is a city that has set remarkably high sustainability goals for itself – and by donating this electricity, Bud is offsetting 100% of the electricity used to power Super Bowl week with clean, renewable electricity. Atlanta is the largest city in the South to make the pledge to clean energy and develop a blueprint showing how to get there. As Atlanta hosts its first Super Bowl since 2000, Budweiser's donation aligns with the city's goal of reducing the environmental impact of the Super Bowl and creating a lasting legacy. The program also builds on Anheuser-Busch's ambitious 2025 Sustainability Goals, which guide the brewer's industry-leading sustainability efforts in the U.S.
"As a member of RE100, Anheuser-Busch is committed to sourcing 100 percent renewable electricity. We are thrilled the company is spotlighting this to its consumers during the Super Bowl," said Amy Davidsen, Executive Director – North America, The Climate Group. "It's exciting to see Budweiser partner with Atlanta to power the city with renewables, too. By working together to drive down emissions, businesses and local governments can accelerate the clean energy transition around the world." To continue doing its part with people all across the country, Budweiser wants to inspire communities to adopt the use of clean electricity in their homes. With the help of Drift, a leader in the clean electricity space, the two brands are making it easier than ever for people to upgrade their own homes and opt for green electricity sources. Beginning today, through Sunday, February 7, Budweiser and Drift will offer one month's free trial of a green plan to consumers who sign up as a thank you for making the switch. Fans can watch "Wind Never Felt Better" on Budweiser's YouTube page and follow the brand on Twitter, Instagram and Facebook. To make the switch to clean electricity, visit joindrift.com/Budweiser.